Konica Minolta promotes information disclosure and communication with stakeholders, based on the concepts of transparency and continuity. We disclose information about the environmental activities of the entire Group, through the issuance of reports such as this online version of the Environmental Report, other media, such as an environmental website, and various other measures. We publish annual reports introducing the activities of the Group as a whole, as well as of individual sites. In fiscal year 2006, we began to post an online version of our Environmental Report, to explain the measures being adopted across the entire Group towards reducing environmental impact, and to convey our respect for the environment. 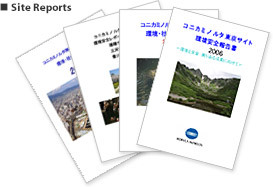 We also publish Site Reports that detail environmental information about our business sites in Japan. Konica Minolta has been active in acquiring Type I environmental labels as proof that our products are having less environmental impact. Concerning Germany's Blue Angel certification, the world's first Type I environmental label, each time its criteria are revised to become more stringent, Konica Minolta has acquired certification ahead of any other manufacturer in the category of digital multifunctional peripherals (MFPs), one of our primary product categories. In the category of office printing devices (office output devices), newly established in January 2007, the bizhub 420 was awarded Blue Angel certification, a global first. By the end of March 2007, we obtained certification for a total of 15 models. In regard to the Eco-Mark, Japan's leading Type I environmental label, we are striving to obtain certification in principle for our office information technology equipment. Under the EcoLeaf system, a Type III environmental label stipulated in Japan, we quantitatively identify and disclose the environmental impact of designated products throughout their lifecycle, ranging from procurement of raw materials to assembly, sales, use, disposal and recycling. Konica Minolta has also acquired "system certification," affirming that we have a mechanism for appropriately and efficiently identifying such environmental impact data for our copying and printing businesses. We have also registered the following categories of products with the Green Purchasing Network of Japan: copiers/MFPs printers/fax machines, copy paper, and digital printing presses. Environmental information on these products is published regularly. Certification is provided for products recognized by the Japan Environmental Association as having low environmental impact. The world's first environmental label, introduced in Germany in 1978. Products and services certified as having low environmental impact are permitted to bear this label. This Program, implemented since 1995 under a Japanese-US agreement, uses the ENERGY STAR mark to label energy-saving OA equipment that meets its guidelines. The EcoLeaf is intended to quantitatively identify and disclose the environmental impact of labeled products throughout their lifecycle. In December 2006, we participated in Japan's largest environmental exhibition, Eco Products 2006, held at the Tokyo Big Sight trade show center. At this event, Konica Minolta presented its broad line-up of environmentally sound products, ranging from MFPs, printers, and other office devices, to on-demand printing devices, textile printers, and other equipment for industrial use. We also introduced haiku works (short poems) submitted by applicants for the Konica Minolta Eco Haiku Award, which annually invites public participation, and showed the environmental awareness-raising program One Planet, The Earth using Konica Minolta's digital planetarium, Media Globe. In the Kansai region, Konica Minolta has set up a permanent booth at Osaka ATC Green Eco Plaza in Osaka Nanko to introduce, in an easy-to-understand manner, our activities in copier recycling. To establish a sustainable society, it is important to develop environmental interest and understanding among the general public. Konica Minolta not only provides environmental education for its employees, but also cooperates in promoting environmental education for general citizens, in order to heighten environmental awareness of each and every person. As a company that supports regional environmental education, since 2004 Konica Minolta has dispatched its employees as lecturers to deliver environmental lectures at Kawasaki Municipal Masugata Junior High School. In fiscal year 2006, a lecture was given on the theme Reuse and Recycling, at which students enjoyed learning through clay modeling. Participating students commented that they learned that reuse is more eco-friendly than recycling, and that they realized how difficult it is to recycle used items. Since 2005, Konica Minolta has served as a partner company that supports the Kids' ISO 14000 Programme being promoted in Tokyo. The International Art and Technology Cooperation Organization (ArTech), an NPO organizing the Program, has qualified some Konica Minolta employees as Level 1 Eco-Kids Instructors (H type), who evaluate and grade the programs on which children have worked. In October 2006, an inspection party from the Asia/Pacific Cultural Centre for UNESCO (ACCU) visited Hino City, where Konica Minolta's Tokyo site is located, as part of a campaign to promote the United Nations Decade of Education for Sustainable Development. During the party's visit, we explained Konica Minolta's environmental activities, to help disseminate in Japan and abroad, Hino City's environmental initiatives implemented through partnerships among citizens, government, and businesses. This inspection party comprised 30 guests from nine countries, dispatched from working groups aiming at creating teaching materials for environmental education. The visiting guests observed civic activities and participated in events for international exchange at elementary schools in Hino City. In February 2007, Konica Minolta dispatched its employee to give a lecture on the Environment and Chemical Substances to citizens of Hyogo Prefecture. This lecture was organized by the Hyogo Prefectural government and held at the Hyogo Prefectural Assembly Hall, Kobe City. It was designed to help citizens think about various problems concerning chemical substances as well as the PRTR (Pollutant Release and Transfer Register) system. The lecture was open to all citizens of Hyogo Prefecture. As one way to communicate environmental risks in the context of the Japanese PRTR (Pollutant Release and Transfer Register) system, each year since fiscal year 2002, we have held Community Environmental Briefings. In fiscal year 2006, we organized the Briefing at our Tokyo Site, Itami Site, and Mizuho Site (where the Briefing was held jointly by our three sites in the Tokai Region). To maintain our high level of corporate transparency, we continue to promote the disclosure of information so as to maintain the trust and sense of security of local communities. We also readily accept plant observation requests from the local community, schools, the local government and companies both within and outside Japan.